Your spine surgery may involve the placement of screws or other implants in the spine. Traditionally, these are placed freehand or with X-ray guidance. Despite careful technique, there is a chance of implants being placed in an inaccurate position – posing a risk to the spinal cord, spinal nerves or other structures. Spinal navigation uses modern computer technology to increase the accuracy of placement – increasing safety. The Renaissance Robotics system is one of 2 main systems that Dr Ball can use for your surgery. The choice of system depends primarily on the type of surgery required. Both have demonstrated high rates of accuracy. 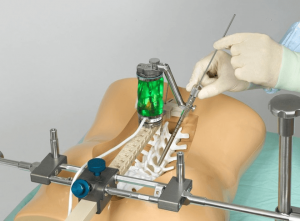 The Renaissance system uses a robotic guidance device mounted to the patients spine to deliver screws along a pre-planned trajectory. Using the Renaissance™ Robotic system, the surgeon plans the surgery on a pre-operative CT scan. This provides a template for the surgery. The optimal screw placement is planned on a pre-operative CT (left) and the Renaissance system delivers screw trajectories based on this plan. The robot positions the instruments so that screws are placed along the pre-planned trajectory.